Posted January 11, 2016 . 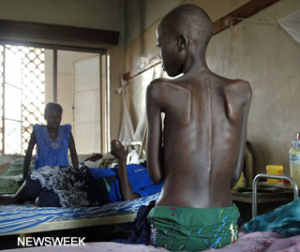 Newsweek highlighted the plight of the truly neglected disease cryptococcal meningitis last week. “Crypto, a fungal infection of the brain and spinal cord, is a threat primarily to people living with HIV/AIDS. A so-called opportunistic infection, it preys on those who lack access to the antiretroviral therapy that can keep HIV in check. Infection occurs when a person inhales the airborne spores of Cryptococcus, a fungus in soil around the world”. The Newsweek report highlights that “Globally, the disease claims up to 300,000 lives every year.Yet despite its outsize impact on human health, the disease has all but vanished from public view. There is no day named for its awareness, no celebrity ambassador to champion its demise. The World Health Organization (WHO) team tasked with addressing cryptococcal meningitis is a team of one” . Tragically it was named only once in the latest 500 page UNAIDS report. BBC highlights cryptococcal meningitis – watch a short video link (starts at 4.30 mins) of an interview with Fungal experts Tom Harrison and Angela Loyse from St George’s University, London.